Psion, the stars await, in the Trinity 1E Bundle. 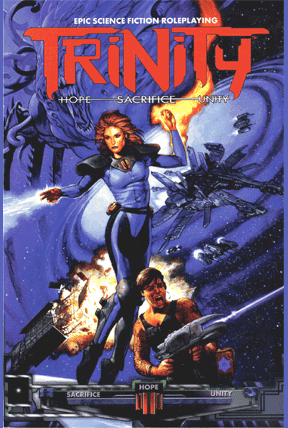 This bundle presents PDF ebooks of the 1997 first edition of Trinity, the table-top roleplaying game originally published by White Wolf. This bargain-priced collection gives you everything you need for a complete campaign of diverse heroism in the 22nd Century. For just US$9.95 (£7.55) you get all five titles in the Starter Collection (retail value $44/£33.40) as PDF ebooks, including the complete Trinity First Edition rulebook, the Trinity Players Guide, the Technology Manual, and two Psi Order sourcebooks (America Offline and Shattered Europe). If you pay more than the threshold price of $20.66 (£15.70), you’ll level up and also get our entire Bonus Collection with nine more supplements worth an additional $80 (£60.70), including three more Psi Order sourcebooks (Terra Verde, Luna Rising, and Stellar Frontier), the complete Darkness Revealed trilogy of adventures, and three short Field Reports (Extrasolar Colonies, Media, and Psi Laws). 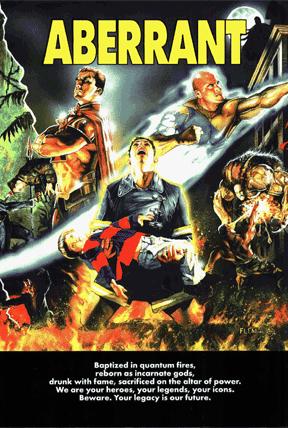 Also on Bundle of Holding is the Aberrant Bundle, the table-top roleplaying game of paranormals in the Trinity Universe, which deconstructs superheroes in the manner of Watchmen. As a super-powered “nova” in the near-future, players experience the front lines of a struggle that shapes the future. This collection gives everything needed to run stories about quantum-powered metahumans with the power to reshape society. For $12.95 (£9.80) you receive the Starter Collection (retail value $50/£38) as PDF ebooks, including the complete Aberrant rulebook and Players Guide, plus the Storytellers Screen with its three-episode introductory story, “Permanent Vacation” (nothing to do with Aerosmith). If you pay more than the threshold price of $24.81 (£18.82), you will receive a further five supplements worth $74 (£56.12), including the Year One setting book that describes the (then, when it was first published) near-future world of 2008, the sourcebooks Elites and Teragen, and the scenario collection Worldwide: Phase II, which advances the timeline to 2015. Not only are these excellent deals, but they also help charity too. Ten percent of all payments (after payment gateway fees) go to the Bodhana Group. This charity advocates table-top gaming as a directed therapeutic and clinical practice that can benefit personal growth, as well as enhance social and educational services to individuals and families.